William Lee Kightlinger, 75, or Bill to many, and Grandpa to others was born in Inglewood, California to Ralph and Theo Kightlinger. He always had a great right hook but was no match for Parkinson's disease. Bill worked for the Good Year Tire Factory for several years, a truck driver for many, and later opened his own business repairing radiators in the town he called home since 1987, Vian, OK. 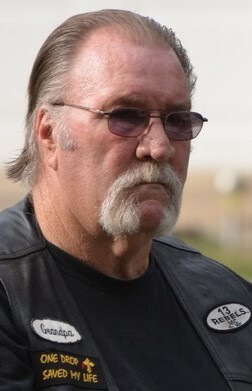 He was a lifelong motorcycle enthusiast and a proud member of the 13 REBELS Motorcycle Club, but his greatest accomplishments were his family. He leaves behind his wife, Gail Kightlinger of Blackgum, OK, daughter, Sharon Kightlinger of Harrah, OK, sons, Donnie and Linda Kightlinger of Roland, OK, Keith and Ashley Holloway of Duncan, OK, Ken and Kathy Holloway of Catoosa, OK, Billey Holloway of Vian, OK, brother, Bob and Bonnie Kightlinger of Virginia Beach, VA, sister Joann Payne of Salina, OK, 10 grandchildren, and 6 great grandchildren. He is preceded in death by his mother and father, infant son Michael Kightlinger, and brother in-law Guy Payne. Bill lived a short 75 years on this earth and visitation will be held for family and friends on Friday, Feb 8, 2019 from 5-7pm in the Sequoyah Memorial Chapel of Forever Memories Funeral Service, 463505 Hwy 101, Sallisaw. Funeral services will be held on Sat, Feb 9, 2019 at noon in the Sequoyah Memorial Chapel with Chad Buttery and Curtis Davis officiating. Bill will be laid to rest in Box Cemetery, Vian, OK, under the direction of Forever Memories Funeral Services following his celebration of life. Pallbearers are, Mike Davis, Tommy Baldridge, Tanner Powell, Andy O'Haver, and his wonderful Nurses who cared for him in his final months, Zac Reed and Dalton Skalenda. And Bill would want you to know before leaving his company, "God Bless". R.I.P. my Friend and Brother!! Ride Hard!!! God Bless you Bill, no matter when or where he never let you leave without saying God Bless you Love you. Well Bill God bless you and we love you always. May you ride high in the sky untill we meet again our friend. May God be with your family and give them peace and comfort at this difficult time amen. Message from Dave Smith & Family. You were a great brother and friend. We are gonna miss you immensely. We all know you’re riding through the pearly gates. Forever your family, The Smith’s. You where a awesome brother. Spread your wings and fly high. Until we see u again. God Bless. Mau God bless this special family in their time of need.